Ekaterina Shcherbina, curator of the ‘India: Jewels that conquered the world’ exhibition talks to RIR about Russian interest in Indian jewellery and the popularity of the expo being held at the Kremlin museum. How did you get an idea to hold an exhibition of Indian jewellery in Moscow? Was it difficult to arrange it? We have been considering this idea for several years. It is not accidental for the Museums of the Moscow Kremlin: we have rich collections of Russian and foreign jewellery, however, we didn’t have many Indian works in our collections. 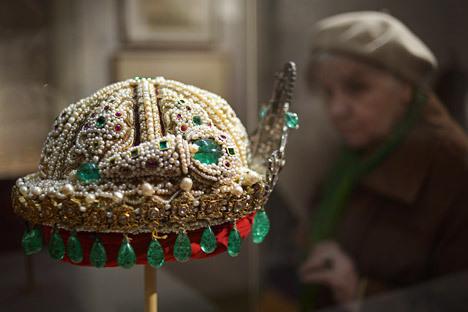 The Russian tsars and emperors’ regalia are kept in the Moscow Kremlin, and plenty of them are decorated with legendary gems that came a long way from India to reach us. Besides, lately we have actively cooperated with many big European jewellers; for example, recently, we had a Cartier exhibition, and one can see an evident Indian trace in their creative work. We know that our visitors take a vivid interest in art of jewellery, and India is a country where there is a special attitude towards jewellery. The jewellery of the Indian maharajas is a symbol of exorbitant luxury and grandeur for Europe. We also would like our visitors to realise once again how multifaceted the mutual impact of Indian and European cultural traditions in jewellery is. Do you think Russian and Indian attitude towards gems is different? Does it say something about the mentality? I think there is no other country where people love jewels as much as in India. In Russia people have also loved gems but the traditions of using gems in their clothes have been more ‘reserved.’ But compared to Europe, Russian attitudes towards gems are more Oriental. People admire the natural beauty of gems and not the refined preciseness of their facets. That’s why in Russia precious items have been decorated with splendid cabochons (unpolished or specially polished gems) for a long time. But in contrast to Indian traditions, the cabochons were put in the beautifully gilded settings and placed on the works of art as special décor elements. What are your favourite exhibits? There are so many exhibits I can name! For example, I find the harmony and finesse of execution of a small jade Taviz pendant encrusted with gems (Victoria and Albert Museum collection, London) stunning. A golden Vanki bracelet with a wonderful hammered design (Barbier-Mueller collection, Geneva) is completely different but just as mesmerising. A golden hookah with incredible enamel setting (Khalili museum collection, London) is gorgeous. An earring with a diamond flower, bell pendant and pearl string (Al-Sabakh collection, Kuwait) is very elegant. Works by contemporary Indian jewellers also look amazing. Do many people visit the exhibition? How do they react? The exhibition has aroused a great interest. There are a growing number of visitors: those who enjoyed it spread the word among their friends. I have no doubt that the number of guests will increase during summer months but I can say that even now at weekends the museum has to restrict the access to the halls sometimes to avoid the crowds near the showcases: the halls are not very spacious, and people stay there for a long time admiring the works and studying the information materials. In Russian society, Indian culture is very popular, and a chance to see the true masterpieces of the jewellery art with their own eyes makes many people really happy. Have you ever been to India? Which Indian cities would you like to visit? No, unfortunately, I haven’t been to India. But I’ve learnt a lot about this amazing country and the jewellery traditions of various Indian regions while preparing this exhibition. I would love to visit such outstanding centres as Delhi, Mumbai, Hyderabad and Madurai.